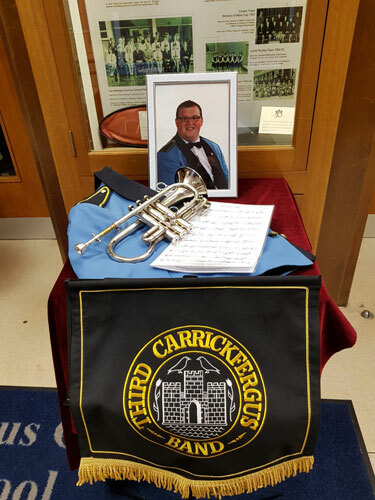 The Band would like to express it's sincere thanks to all those who attended and made donations in aid of Peter Arthurs's daughter Isabella and Cancer Focus N.I. We are overwhelmed with your generosity and support. The concert which was held on Thursday 22nd February in Carrickfergus Grammar School was a complete sell out and featured the band under the baton of Director of Music, Brian Connolly, The Third Carrickfergus Youth Band under the direction of Des Graham, the wonderful Carrickfergus Grammar School Senior Choir under the direction of Edward Craig and renowned mezzo soprano Sheelagh Greer and accomplished accompanist Stephen Hamill who all gave their time and services completely free of charge for this event. 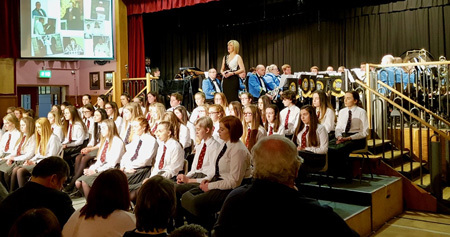 The event was admirably compered by the band's David Hawthorne who delivered a beautiful eulogy to Peter at the start of the evening while the band's technical wizard Peter Graham put together a visual display showing various picture montages which were shown throughout the concert. Special thanks go also to our own Ruth Binding whose enthusiasm and drive in the organisation ensured the success of the event. This in conjunction with all of the assistance received by those who provided tea and biscuits at the interval and all the unseen work that is needed to produce a concert of this size. Guests of honour at the event were members of Peter's family who, along with the packed hall were taken on both an emotional yet uplifting journey through music. The proceeds from all ticket sales, donations and refreshments went entirely towards the two beneficiaries of the evening. At Gillian's (Peter's widow) request, Cancer Focus Northern Ireland was the Charity Partner for the evening. they continue to provide support to Gillian and Isabella. All other proceeds went towards Isabella's future development and education.